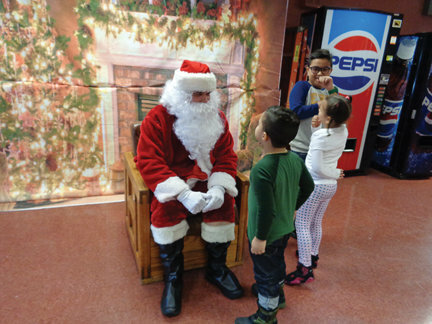 Children living the North Bergen Housing Authority got their gifts a week early at the third annual Christmas Party at Lawler Towers last Saturday. Each child walked up to Santa to get a gift. Sebastian Moza, 9, said Christmas is his favorite time of year. “You get to see the people in your family and you get presents,” he said, focusing on his free lunch of pizza. Moza’s cousin Ceana Castello, 6, had a specific gift wish in mind: “Shopkins!” she exclaimed, referring to the popular toy brand. Her older brother Jayden, 11, seemed slightly less interested in the Santa aesthetic. “It’s fun for little ones, and it’s nice,” he said. He was hoping for a new basketball so he could work on his skills as point guard for Horace Mann No. 9’s basketball team. “It’s a very positive thing to be done in the Housing Authority,” Mayor Nicholas Sacco commented as the kids began receiving their gifts. The process began with a tree lighting in November. There, children wrote down the gifts they wanted and put them in a mailbox. Sanzari’s staff got them and ensured each kid received at least one gift from the list. Sanzari also helps raise money for the event through The Renaissance Corp, his non-profit organization for affordable housing in North Bergen. Businesses throughout the township also help pitch in for the cost.